Men with a burning need to express more of their Feminine side typically do it by connecting with archetypal Venus – fashion, appearance and the arts – rather than the nurturing Moon. 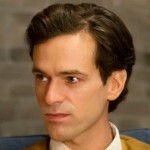 The New Girlfriend, written and directed by François Ozon, and adapted from a fictional work by Ruth Rendell, features the rare male protagonist who chooses to mirror both aspects of womanhood. The movie begins with a nod to a couple of real females, Claire and Laura, and quickly charts their affectionate childhood friendship that follows them into adulthood. Soon after she becomes a mother, Laura dies. Claire (Anaïs Demoustier), who is married to the supportive Gilles (Raphaël Personnaz), is grief-stricken. 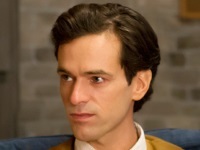 When Claire pays a surprise visit to deceased Laura’s bereft spouse, David (Romain Duris), she’s stunned. It’s feeding time, and he’s peacefully giving the bottle to his infant daughter Lucie, while wearing a wig of woman’s hair and dressed from head to toe in one of Laura’s outfits. He explains he had shared his cross-dressing secret with the accepting Laura. Now, as widower, he says wearing her clothes keeps his wife near. Claire is not convinced. “You’re doing it for your own pleasure, not for Laura,” she says. Nevertheless, Claire, too, promises to guard his secret. From this point on, the movie becomes a joint discovery between David, who becomes progressively freer to explore these female archetypes, and the loyal Claire, who also benefits. She gains a new, grateful “girlfriend,” renamed “Virginie,” with whom she hits the malls. But, through David/“Virginie,” she now has a pseudo-accessibility to her BFF. It’s as though lipstick, which we see used to prettify Laura in her coffin, is resurrected in David’s increasingly creative hands and psyche. Eventually the movie examines whether David’s enveloping himself in women’s clothing is simply a cover-up or a validation of Lunar feelings that lie beneath the surface. Archetypal Venus rules beauty, relationship, harmony and, just as importantly, values. Through Claire, David goes on a journey of self-discovery to determine what he genuinely holds dear and how much he can emotionally commit to and nurture his newly manifested Feminine self. Archetypes: The Feminine. Mother. Beauty. Harmony.